My co-host this month is not only hilarious and inspiring, but she's such a gem in the blogging world. Amanda's honest, she's kind, and she writes the BEST blogging posts ever. And we so happen to have named our blogging series the same name (here's hers/here's mine). So basically, we're twins. But I'll let her do some talking now and introduce herself to ya! 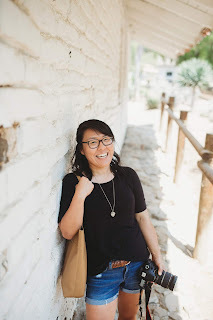 Here are a few things you should know about me: I don't like coffee, and I don't own a smart phone, so you won't hear me talking about apps or coffee shops on the blog. What DO I love? Jesus, writing funny stories, sharing running and blogging tips, and making Shutterfly photobooks. Oh, and eating cupcakes. Come over and visit me at The Lady Okie Blog, and I'm sure we'll be friends in no time. When Amanda and I were brainstorming topics, we went back and forth about a few different ones but landed on this one because we both wanted something fun and for lack of a better word, different. I think this prompt could go in so many different directions and I can't wait to read yours! EATEN A PB&J SANDWICH. Weird, right? Well, not so weird if you're allergic to peanuts! Honestly, sometimes I wish that I wasn't just so I could have an easy go-to snack/meal, though. READ OR WATCHED HARRY POTTER. I'm sure you're either A.) leaving this blog immediately or B.) gasping with disbelief. My parents were never huge fans of the idea of magic when I was a kid so I never jumped on the Harry Potter train. Someday, maybe? USED A DISHWASHER. I've actually already disclosed this fact before, but maybe (hopefully?) you haven't read this one too recently. My parents prefer hand-washing dishes so that's all I've ever known! GONE TO PROM (OR ANY HIGH SCHOOL DANCE, FOR THE MATTER). I'm not sure I actually missed out on any of this, though. You can call me a crazy person for skipping out on this but I'll just call myself a thrifty homebody. HAD A CUP OF COFFEE. I'm thinking that this prompt could be answered with a lot of food facts about yours truly. But I have never had one cup of coffee (except for a frozen mocha drink my dad got). The smell and taste is just not my jam. LEFT THE COUNTRY. This is one of the ones I really want to change, though! I've never left the country (not even Canada) but I hope to someday because although traveling sometimes stresses me out (or mostly airports/airplanes), I know there's a lot out there that I have yet to see. 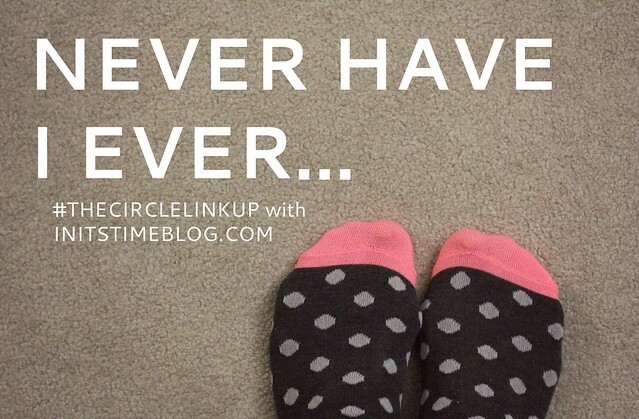 So what have YOU never ever done before? Is there anything that we have in common or anything that you hope to never accomplish someday? Jot them down and link up with us! Amanda and I cannot wait to dive into your posts! To join in, please grab a button, link-up your post and then meet/chat/discover other bloggers. Thank you so much for helping The Circle grow! Mark your calendars because next month we're writing (and sharing!) letters to our past selves. Feel free to write a serious letter, a silly letter, or something in between. You could choose to write to your past self as a child, teenager, or even last year's self, too. And if you're bold, share an old photo, too! The link-up will go live on Wednesday, February 11th and I cannot wait to read your letters then! Your list is really neat! I have never met someone who has not eaten a pb&j or drank coffee! That's a fun fact. When I live in Asia I hand wash my dishes but in America I use a dishwasher. I honestly enjoy both but something about washing by hand makes me use less dishes and slow down a bit. 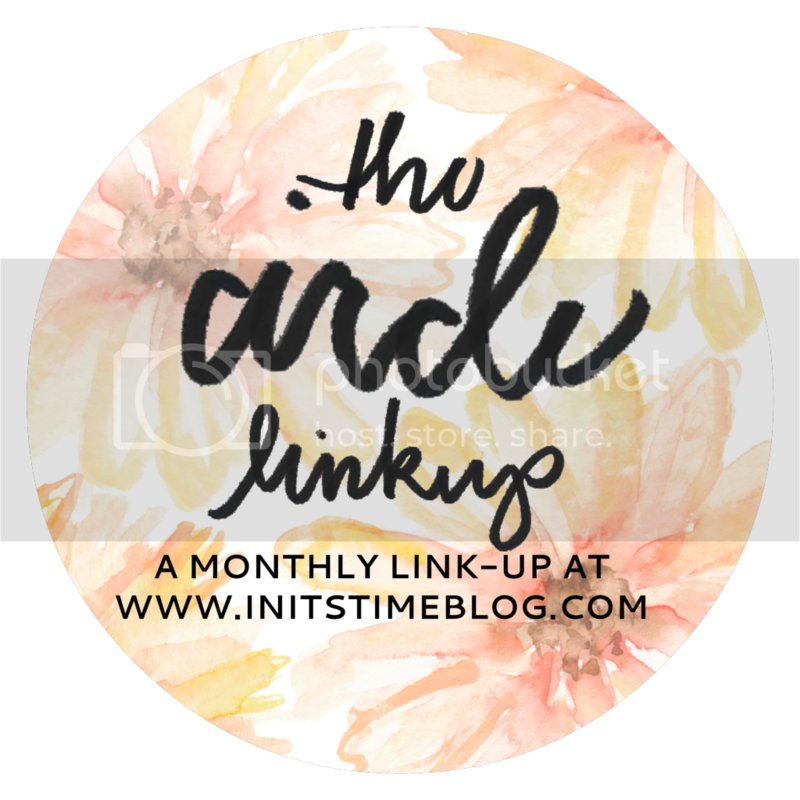 Thanks for hosting this fun linkup! I must admit, I couldn't come up with anything for this topic... but now that I'm reading your post and Amanda's, I'm realizing how darn fun this prompt is! So interesting to see what people have to say - and surprising! Really, no Harry Potter? Someday you'll have to binge-read the series. Wow you have some impressive things you've never done! I too have never watched Harry potter but no dishwasher? Crazy! I've never read Harry Potter either!! I've never used a dishwasher either! There's one in my apartment, but like you, my parents always washed dishes by hand, so that's what makes sense to me. I had a dishwasher for 2 years in college and I wasn't impressed. I like to consider myself a champion at washing dishes by hand! :) I also never went to a school dance, and coffee is not my jam either. But the smell of coffee? Yum! You and I have several things in common! I've never read all the HP books (though I have seen the movies...I was one of those "There's a movie, WHY would I read the book?!?!" people for years...I'm not that person anymore.) AND I've never left the states either. The PB&J thing really messed with me, until you reminded me that you're allergic to peanuts. I ALWAYS forget that about you. What a fun link-up! I absolutely love Amanda and her blog. :) And I hope you get to read Harry Potter sooner than later! Also, I hope that you still enjoy it even though you won't get to experience it as a child. Speaking of which, you should stop by for my "I believe..." link-up with Amanda on Monday. I think one of my beliefs (re: Harry Potter) will make you laugh! btw, can you have Almond Butter??? cause that is yummy, too! The no PB&J is not too weird since you had an allergy. I had a friend who dated some guy who never eaten bread (no allergy) just never had it. I don't want to do without my dishwasher, use it everyday! I've never read of watched any Harry Potter either, my parents, like yours, weren't too fond of the magic part of it, but then when I got older, it's almost like there is too much hype about it? too many of my friends say I "have to read it!! "so it makes me not really care to. but who know!? I have tasted coffee before, but yuck! I love the smell of it though! Not interested in watching or reading Harry Potter either! I've never had a full cup of coffee either! I love the smell, but the taste is naaaasty to me. I don't know how people do it. Seriously. I fully support the notion of reading Harry Potter at some point. I read them starting in third grade, but it was really controversial at the time. I'm glad they let me read them! They became so much of an escape for me and really instilled a love for reading in me at a young age. I love this list. My heart is sad that you haven't experienced Harry Potter ;), it is one of my all time favorite stories both the books and the films. When it comes to the dishwasher though, for me I use it but only when I have a TON of dishes, it saves water to wash in the sink so the hippy in me agrees with that. I'm slightly mourning your peanut allergy because peanut butter and jelly (and banana!) sandwiches are the bomb. And what's with this no Harry Potter business? I'm going to need a moment of silence. You should totally pick up a Harry Potter book (: They're honestly amazing. If it ends up not being your cup of tea afterward, then it's totally fine (no judgement!). But definitely read a few chapters- you should be hooked by then (; Also, I love hand washing things! Unless there are dishes from a ton of people, then I definitely would rather to do them myself. I'm addicted to coffee. I love it so much and that short time of being a barista really just made it worse. ha! I can't wait to read your post! Twins for the win! :) I love books, too, but never really got into Harry Potter. A LOT of people recommend the series, however, so I may have to try it someday, we'll see if that happens sooner than later! It IS fun! I was worried I wouldn't be able to come up with stuff (or that my list would be deemed boring) but it's actually a lot of fun! I'm SOOOOO with you! People everywhere tell me to pick them up and just give them a try. But part of me thinks it's a lot of hype and the other part of me is wee bit curious. But long books sometimes overwhelm me (true story) so I still haven't picked them up! Me, too! I cannot wait to read your list! Yes! I'm doing an ESOL endorsement. I'm hoping that will open up some more high quality part-time positions for me. So far, it's not too bad, but we have some pretty big projects coming up soon. I feel a little in over my head, but now that I have my first homework assignment under my belt, I'm feeling better about things. I love that we continue finding things we have in common!!! And I think I will at some point. I think that it's something that I would be more open to now and while I'm not really feeling the need to, I do want to at least see what they're all about at some point! Hooray for hippies! :) I actually always thought that hand-washing would use up more water, but I could see that smaller loads would be better to hand-wash than to use the dishwasher. We have lots in common--except the coffee, I guess! I think that if I enjoyed the taste, I would really be addicted to it (I mean, teachers need energy, right?). And I think that there are definitely pros and cons to school dances and proms. I think that if I wanted to go, I would have. But I don't have any regrets not going, either. And we'll have to leave the country together or something because I'd loooove to meet up with ya! Ooh, I could definitely see that! Where I live, having that ESOL endorsement really seems like a must because there are so many children and families that need that extra support. That said, it's good to hear it's at least bearable to get while you're teaching! :) Good luck with it!! Great topic! I can't believe a lot of these--you have a lots of fun facts, girl! Thanks, Jessica! I have loved getting to know other people and am grateful that Amanda suggested the idea. also. my jaw is hanging open. And so many people have told me to pick up a HP book! I know that I will at some point, but I guess I need some more poking or something to pick up a book sooner than later, haha.